Toilet grab bars uphold your weight with doubly reinforced T-bars for extra support. Padded, easy-grasp toilet safety bars extend to nonslip base to ease the up and down strain of using the toilet seat. Magazine rack fits on either rail for convenience. Aluminum is 29 1/4" W x 26 1/2" H x 19" L. Supports 300 pounds; assembly required. No express shipping. *Add $5 to shipping. I was a little skeptical, but ordered anyway. Glad I did. Works great! This is a high quality item, much better than anticipated. Very easy to assemble, no tools needed. Works great and looks good as well. If you need a little help with getting on and off the toilet this will certainly solve your issue. Purchased Aug 2012 for my 89 yr old mother after she had a mild stroke. My brother screwed it together as I was not sure I could do this well. Mom weighs 148 and this is very durable for her. Beautiful design--I love the smooth soft hand grips for her. White means the dust does not show! Our bathrooms are white w/ some black on tiles so it matches. Plan to get one for the other bathroom. Other options required screwing into our new toilet & for the same price this one looked much better! Price is fair for the wonderful value. Is a very large sized shipping box so extra postage is very fair too. 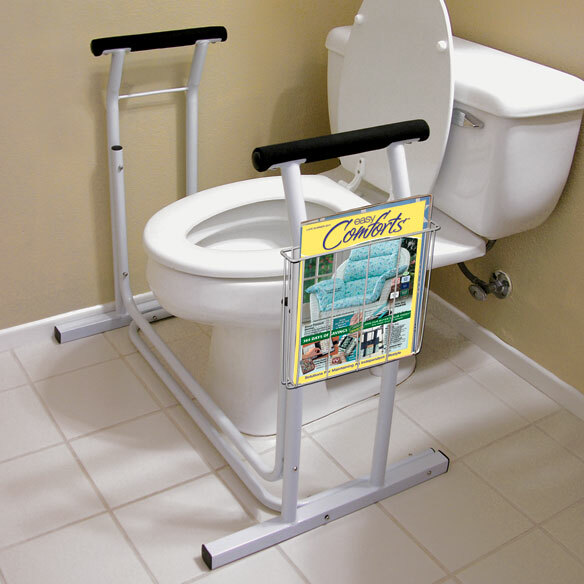 This is a great item for anyone that has week knee and simply have difficult standing up on the toilet. The assembling was simple and the product was heavy-duty. I added some rubber sticker for the bottom of the item to keep it from touching the bathroom floor and getting wet. It is much more attractive than the one we had that attached to the commode seat and was always getting rusty and very difficult to keep clean. It is easy to move for cleaning, which is very helpful to us. We also feel very safe with it. I bought this for my wife as she recently had total knee replacement surgery and obviously can't sit down, stand up, or even walk around without some assistance.While a walker works for walking, these toilet grab bars are the most important life saver for her for obvious reasons. Prior to that it was a struggle for her to use the toilet. It not only fits back and against the toilet, but sits firmly on the floor, is just heavy enough to stay, but still easy to move out if desired. The package came unassembled, but it was a breeze putting it together, not only were the instructions crystal clear it was evident that someone had designed and planned and thought it out very thoroughly as it has been the easiest piece of equipment to assemble I have done. I highly recommend this for anyone who needs help in sitting and standing, and I believe it could also be used at some room chairs for assistance there also. Great Product, but misleading price. I purchased this product for our church bathroom so that people who needed assistance in getting up or down could use the toilet easily. It is much better than bars that you find in most handicap bathrooms because it supports the person up and down. I am using this to help my 91 year old mother get up from a chair that does not have arms to help her. This is the right height for use at a toilet. However, it was advertised as having a non-slip base and it doesn't. We have had to put rug gripping material under the base to help keep it in place and that is moderately satisfactory. If you just need minor assistance getting up from the toilet this may work for you. It is very light and moves while in use. Maybe needs to be screwed into flooring. this should be taken off the market it broke after 10 minutes of use cheaply made with a high price. mine is held together with duct tape and angle brackets now. because at the bottom it has broken all the way around.do not waste your money on this item because of safety issue.i did not purchase it from here but it is the same product. no reflection on this company remember they just sell these items.they do not manufacture these items. I bought this product for my Mom. When the box arrived, we opened it but found NO INSTRUCTIONS on how to assemble it. Upon contacting Easy Comforts about this problem and wanting a refund, they refused to refund shipping costs even though we consider it defective due to no assembly instructions. NO MORE EASY COMFORTS PURCHASES FOR US!!!!! Hopefully this item will help. Won’t know until I use it. My knees are weak and I need assistance to stand up. We already have one. It is very helpful for sitting and standing. We now need one in our second bathroom. Because my spouse will be having knee surgery and this assistance looks like it would be valuable to have. It looks stable and does not have to be attached directly to the toilet. Ease of use. For 94 yr-old mother - needs supports to brace her arms getting up from toilet stool. For my 89 year old mother-in-law. A high toilet seat is great but having help to rise up at her age is even better. A commode does not always fit over the high toilet seats and this way she only has one toilet seat to clean. Easily fits around toilet bowl. no added plastic, odor absorbing seat. My arthritic back and knee make it very difficult to rise from a sitting position. My wife has trouble standing and this will help here greatly. For my mom who is 90 and needs support to get up from toilet. To help my Father live independently. Recovering from hip surgery. This will be a good assistance to take some weight off my hips. Do I fall transferring to the toilet. Have one and need for second batchroom. It looks easy to move when needed. Its just going to fit my needs better than the one that fastens to the toilet. simple aid for getting up. Getting ready to have knee surgery and I wanted something that wasn't permanent. I chose this because the on bowl handles were always falling off the rim because mother pushes on the handles unevenly. I am hoping that with this having legs to the floor she will be safer. My husband is having knee surgery and I think this will help him get up from the toilet.. Wanted rails on both sides of toilet. It looked more stable than the one you attach at the back of toilet. I need help rising from toilet and have been looking for magazine holder. BEST ANSWER: Thank you for your question. The height for the Deluxe Toilet Safety Support is not adjustable. We hope this information will be of help to you. how to take care of this ? BEST ANSWER: There is no taking care of this item. I've had mine for years and I LOVE it. A damp rag will wipe off anything that gets on it and it doesn't rust. You can also use Clorox wipes to sanitize it if needed. I use the magazine rack to put the plastic grocery bags in for my wastebasket. That way they're handy when my wastebasket gets full. I highly recommend this product. Not sure just what you mean. There is no care required. Just put it together and use it. It's fantastic! I Wipe the metal bars and legs with a Clorox wipe sheets. Where can you get replacement foam for handle bars? BEST ANSWER: I am sorry. I don’t know the answer to that quesition. I do not have this problem with my handle bars. What are the precise measurements of the stand. In particular, how much space is required between the wall on left side on stand and the toilet? The apartment we are moving to has the toilet set VERY close to the wall so I need exact measurements before I make a purchase. BEST ANSWER: Thank you for your question. It is 29 1/4" W. With the magazine rack on it is 31" W. It will depend on how wide our toilet is to know the space. We hope this information will be of help to you. what is the weigh limit? BEST ANSWER: Thank you for your question. It supports up to 300 pounds. We hope this information will be of help to you. where is the store located? anywhere near farmington,mo.? BEST ANSWER: Thank you for your question. Our warehouse is in Oshkosh, WI. We do not sell in stores, only online, over the phone or mail. We hope this information will be of help to you. What is the width between the arms? BEST ANSWER: Thank you for your question. There is 23" between the arms. We hope this information will be of help to you. My space only allows 24 inches width is this toilet grab adjustable? BEST ANSWER: Thank you for your question. Unfortunately, the Toilet Grab Bars are not adjustable. We hope this information will be of help to you.